We've all seen it: That colorful human body, staring blankly ahead in the doctor's office, its stomach skin missing and guts exposed. But have you ever really stepped back and wondered what it took to perfect that anatomical diagram? Long story short, it took centuries of study—and plenty of mistakes, most of which have been lost in the sands of time. But London's Wellcome Library just released over 100,000 images from its archive—which focuses on medical and social history—that offer a unique lens through which we can gaze back at the early days of medicine. The study of anatomy goes as far back as 1,600 BC, when the so-called Edwin Smith Surgical Papyrus is believed to have been written. Thought to have been a military surgery manual, this treatise covers 48 different types of trauma and includes drawings of each. Similar documents came from other ancient cultures—like the Greeks and Romans, who gave us Galen, the preeminent anatomist of the 2nd century. Galen's claim to fame was that he compiled the most comprehensive anatomical charts of his day—but he did so by studying pigs and apes, not humans. Some of the earliest recognizable anatomical images came from none other than Leonardo da Vinci, who produced some 750 such works. His unique talent not only for drawing anatomy but also studying it yielded a number of breakthroughs. Da Vinci, for instance, was the first person to produce an accurate depiction of the human spine, and also made significant progress in our understanding of how the heart works. Again, this was a popular way to look at how the human body worked. Check out this similar drawing with English descriptions, all modeled after Galen's work. 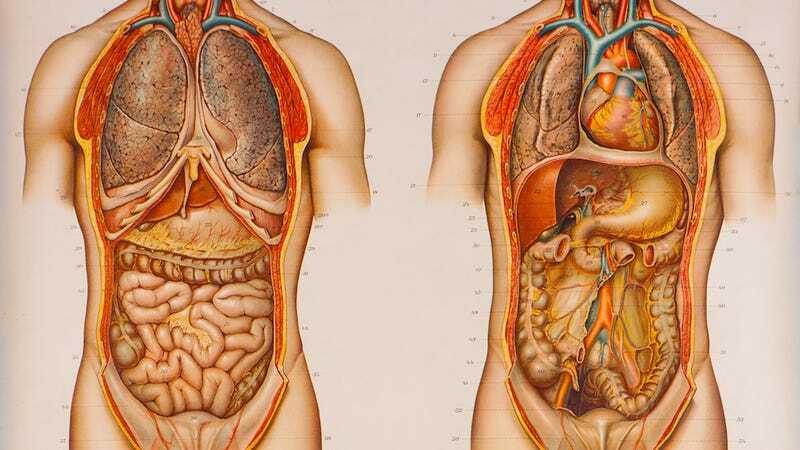 Again, there's not a lot of detail about the internal organs. And the heart is not really shaped like a heart, either. Things get better as we near the Renaissance and Industrial Revolution. Modern day anatomy really gets going by the 16th century, when dissections of human cadavers happened on a more regular basis. It was during this period of medical history that we learned more about how the circulatory system worked, and also discovered the lymphatic system as a discrete network. Not all of the drawings during the Renaissance made such easy sense. This illustration from The Work of Tobias (1707) compares the body's anatomy to the architecture of a house. Without being able to read Hebrew, it's hard to tell exactly what the analogies it's drawing are, but bowels as basement seems pretty astute. As for those colorful pictures in the doctor's office, you can thank Max Brödel, the godfather of modern medical illustrations. Thanks to Brödel's teaching in the early part of the 20th century, medical illustration is a proper profession. The human body never looked so precise. Do you have a favorite that we missed? Drop it in the comments below—and check out Wellcome's entire website here.